A group of parents who had moved their children out of a Borders school which is now being closed have won a battle to have transport provided. Scottish Borders Council has now agreed to put in place transport arrangements for families who moved children from Hobkirk to Denholm Primary School during the last academic year. The council confirmed this week that Hobkirk Primary School is to be mothballed, but declined to respond to allegations from parents that the decision is a result of the failed implementation of a composite class structure introduced in August 2014 for P1 to P7 pupils. The school roll was 21 at start of the 2014/15 term when a composite class was initiated with one teacher. But the school roll at the start of this year was only seven. Several families moved their children out of Hobkirk last year after their complaints about the new composite class structure were not resolved. They say they were told free transport to take the remaining seven children to Denholm would not apply to families who moved children of their accord before the summer. The council has, however, made a U-turn after being threatened with legal action. 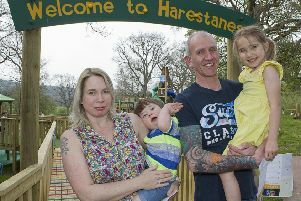 Ms Glen, who lives two miles outside Chesters village, moved her children from Hobkirk to Denholm in March. “The composite class was not adequate and did not work. All my children were unhappy. Since moving to Denholm they have come on leaps and bounds. “We complained, but everything we suggested was rejected. So we had to make a decision in the best interest of our children’s education. After raising concerns about the eduction her daughter was receiving she said she was encouraged to move her daughter to Denholm. “The council created this situation,” she told us. “We were encouraged to move our daughter to Denholm and then denied transport costs. We made several requests, but all were denied. It made me so angry. A Scottish Borders Council spokesperson said: “We cannot comment on individual cases. Families choose to move schools for a number of reasons. “Our schools are structured in accordance with national class size regulations and our headteachers engage with parents on any matter that may be causing concern to a family. It is expected that the school and family work together to resolve concerns. “Following the decision made at the executive meeting on Tuesday, November 3 to mothball Hobkirk Primary School, the council has now been in direct contact with those families who previously moved their children from Hobkirk to Denholm Primary to discuss the provision of transport for their children to Denholm Primary.